Barefoot Bubbly Pink Moscato is a popular Sparkling Wine available from Tesco Wine in 75cl to buy online. Visit Tesco Wine for the best price for 75cl of Barefoot Bubbly Pink Moscato or compare prices on our other Sparkling Wine products. The Moscato grapes were harvested from selected vineyards in the Central Valley at the mouth of the Sacramento Delta; a location which provides beautiful warm days and cool breezy nights that foster ideal weather conditions for perfect fruit ripeness. History Epitomising California cool and relaxed easy-drinking, Barefoot is the wine to be seen with, and is creating excitement wherever it steps. Barefoot is all about great tasting wines and having fun with your mates. All wines in the collection are easy drinking, light, bright and fruity. Since its launch in 2007, Barefoot has been a proud supporter of many charities across the country as well as music, art and sporting events. Helping and giving back to the communities in a fun way is one of our main goals. Regional Information About 100 kilometers from San Francisco and sitting at the foot of the Sierra Nevada Mountains, Californiaâ? ?s Central Valley produces fruit of outstanding quality. Consistently favourable weather conditions create an environment during the growing season in which the grapes enjoy plenty of hangtime. Not only does this area enjoy the benefits of the natural protection and favourable microclimate influenced by the mountains, its soil is rich in minerals. Where to buy Barefoot Bubbly Pink Moscato ? Barefoot Bubbly Pink Moscato Supermarkets & Stockists. 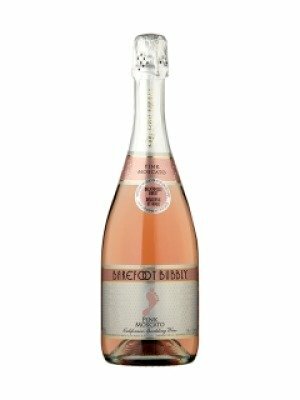 You can buy Barefoot Bubbly Pink Moscato online in most retailers and find it in the Sparkling Wine aisle in supermarkets but we found the best deals online for Barefoot Bubbly Pink Moscato in Tesco Wine, DrinkSupermarket.com, Tesco Groceries, and others. Compare the current price of Barefoot Bubbly Pink Moscato in 75cl size in the table of offers below. Simply click on the button to order Barefoot Bubbly Pink Moscato online now.